After writing Sicario and Hell or High Water, Taylor Sheridan was reportedly the latest prodigy in the streets of theater. My film compadres were saying it, the critics were parading it and I decided to pull this one out and see if the tales were true. I plan to see the two previously mentioned works as well so I can make an educated opinion. Boy, has the Sheridan experiment not gotten off to a good start. Wind River is a stalling truck caught in a snow drift. It surveys its landscape and the harsh life all who remain suffer but also can’t help being a funeral that’s surprisingly hard to empathize with. You almost feel bad being so disconnected from it but the project is so barren that you feel like you’re mourning the life of emptiness itself. Wind River doesn’t make a sound. It is eerily quiet, but after days of inaction, leads to a walk through a morgue rather than an intense murder mystery suffocating in a tundra. Jeremy Renner can work on his cowboy look all night long but it’s still not gonna make Wind River a natural disaster even remotely interesting. Imagine wandering through a hurricane and giving zero cares in the world, thoroughly disinterested by the day’s proceedings like a preoccupied millenial, except in this case you’re grazing through the least exciting storm known to man that still somehow earns the title “hurricane.” That’s Wind River. That was overdramatic even for me. Wind River is not the least exciting storm ever. That would garner it an accolade. Renner and Elizabeth Olsen struggle to do much with a story that is starved of dialogue and greatly lacking in the “stuff to do” department. The account of a pillage is dragged across a cheese grater for nearly two hours. It’s a story that has been stretched too far. I’m not sure if Sheridan had a cramp in his pen hand or struggles with thoughts that exist outside a movie’s borders. I’ve watched more entertaining episodes of Law and Order: SVU. It’s not complex enough to warrant a feature-length work and it shows in the final cut. The flatness of this movie cannot be overstated. It is exceptionally dull. A knife without edge offers little tenacity and Wind River doesn’t dazzle your eye either. As much as I enjoy watching Jeremy Renner’s stunt double bounce on a snowmobile, the organic wilderness around you is begging for a pedestal. The visual department fails to capture the aged relic of the past, one of the pieces that has gone mostly untouched by the modern world. A blistering behemoth with a personality disorder, regularly fluctuating between storm and calm, is underappreciated here. There are a few select shots which grant us a brief showcase, but we should be engulfed in the black hole, disturbed by the unknown and carry a caged paranoia. Wind River is frustrating because it has an avenue for success. Similar to The Road, it has ample opportunity to display color palette and lighting as well as sound design. It forgoes audible creation, deciding on unnerving silence that doesn’t harness fear as much as it thinks it does and displays inexperience in its visual carving, leaving the film neither smooth nor fine-tuned with sharp edges. It looks like a log that was hacked by a teenager with a chainsaw. It wasn’t done out of rage. It was performed by an unguided hand. Renner’s lead lacks the composite of originality and fronts a frontiersman with little bite and less bark. With an inability to stir intrigue and Olsen being almost entirely useless as a rookie on the scene, Wind River‘s character output is anemic. It will lose its grip on viewers early. The public is far more impatient than I am. With little chill, Wind River is fully reliant on Renner, who in my experience doesn’t possess that level of talent. The only development of note is the hunter being the victim of a hunt himself. There’s not enough character molding going on here. You can tell Sheridan was pulling for a winter western but Wind River has neither the cold nor the grit. It’s rather mellow for a western, solemn to the point of feeling sorry for itself. Sheridan manages to drizzle a few lines of concrete here and there to keep myself interested but I’m being left on a thread waiting for the beauty I was told appeared. Drowned in a grief with surprisingly little punch, Wind River doesn’t emote much feeling in me. I’m left distant from a work where the goal should be to bring me closer, not only to adjust to the environment but to understand the gravity of the situation and bear the weight of loss this tale is buried in. The film never bothered to knock on my door and see if I was home. If you enjoy plot pushers, Wind River might meet that criteria. It’s not a film that carries off-screen presence. It leaves me starved for content. 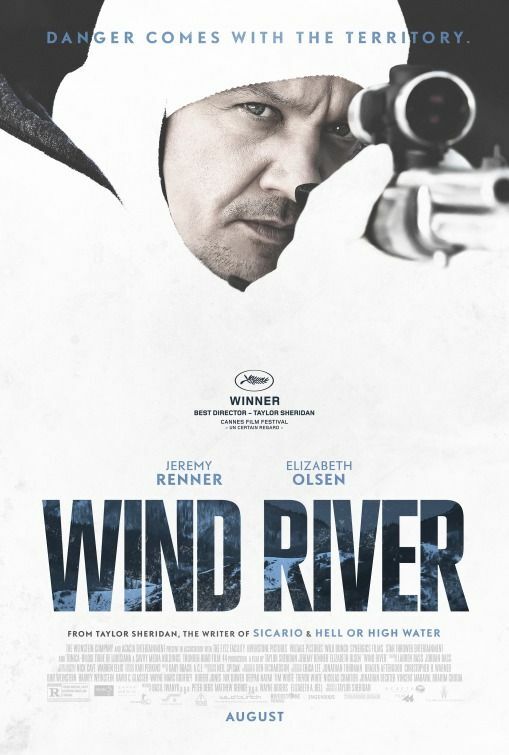 My score for Wind River: 57. If the phrase, “well, it’s either half empty or half empty” was a thing, I’d use it here. I’ve now watched Wind River two times more than I would have liked and I promise there will not be a third. There wasn’t much reason to watch it the first time and there certainly wasn’t to go looking for a second viewing. Skip this one.